Hello to March! Did your month come in like a lion this morning? Or is spring peeking out already? Or do you live on the other side of our beautiful world where the sun is still shining as summer begins to wane. Lucky. Our month gets started with a nod to Instagram. 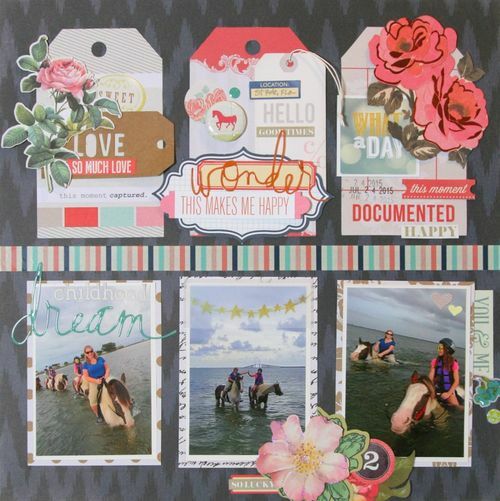 A scrapbooker's paradise of visual pleasure. 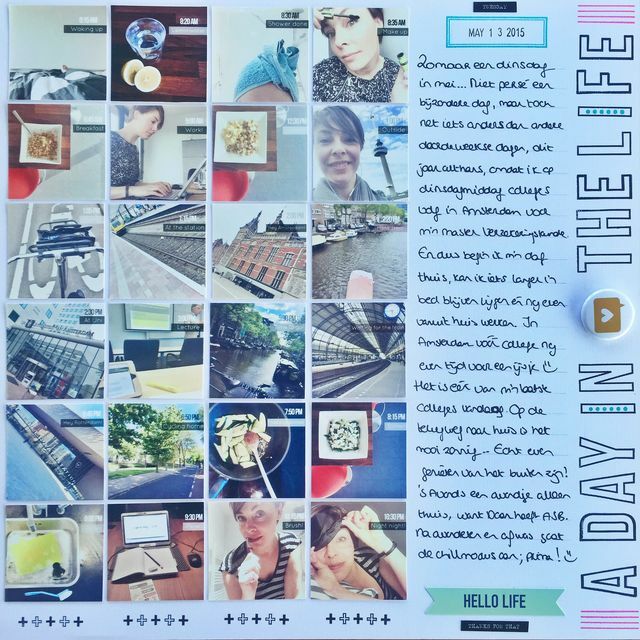 This month we asked our team to create layouts that had something to do with Instagram. As always, they knocked it out of the park. 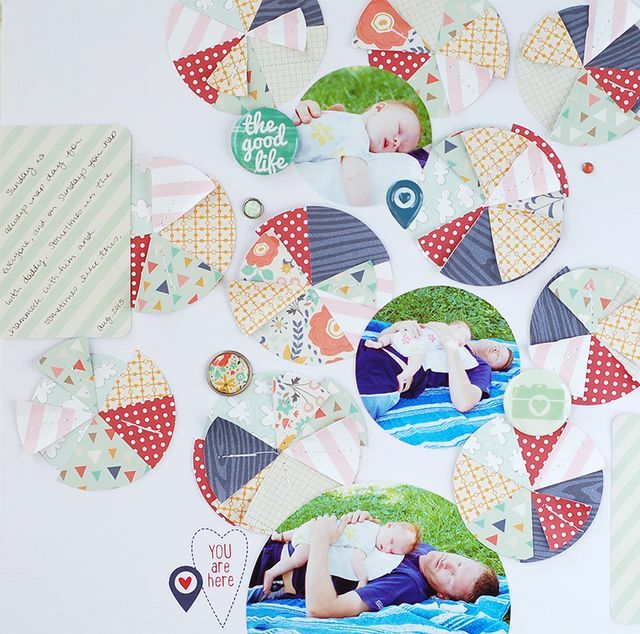 We hope you enjoy their layouts and feel inspired to create one of your own. 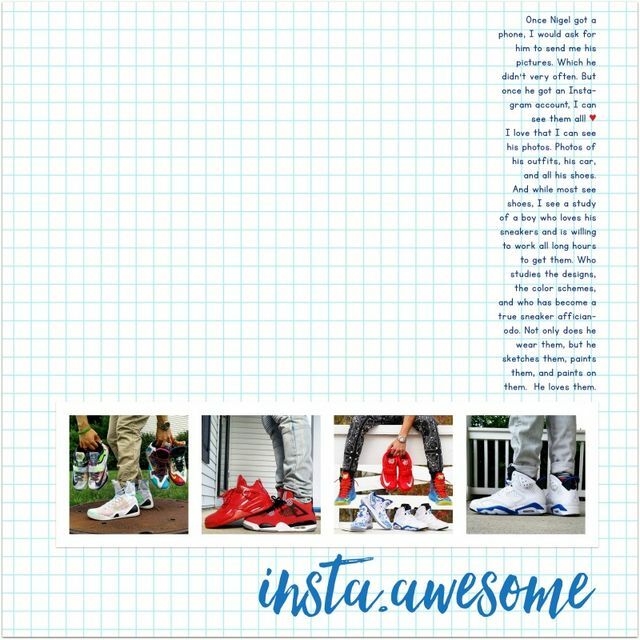 Please enjoy our newest gallery, InstaAwesome. 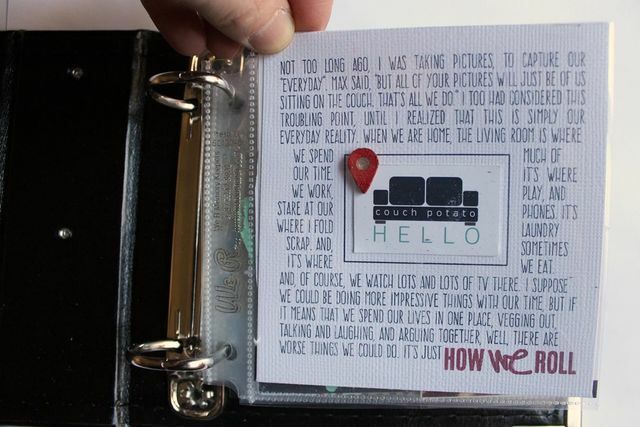 As always, the layouts and the journaling are available if you click over into the photo album. This layout is based on my most recent Instagram photo. 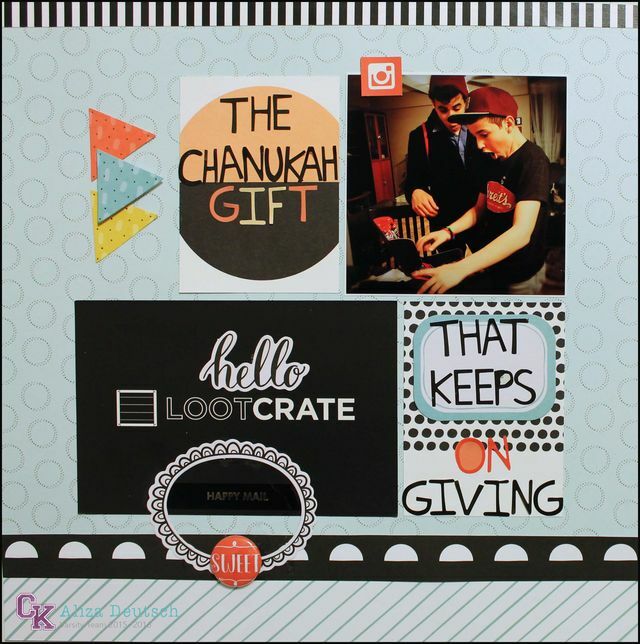 I love the photo and, though it took place in February, it allows me to record this past year’s Chanukah gift. It’s a subscription, so it’s like getting a gift each month of the year. I love the way this layout turned out, but all those letter stickers gave me a run for my money. I have joined a dance performance workshop. I am so excited, and I have ordered a new pair of Jazz shoes. My current pair is from 1993. Lately, I'm much more excited about my daughter's Instagram feed than I am about mine. I used 12 photos from her feed to create a collage of photos in the soon to be gone Picasa. My daughter recently told us that she is "Emo" - and my husband and I both Googled what that was and took the "What Kind Of Emo Are You" and I got "Poser Emo" which means that I'm not actually Emo - but I am enjoying watching her transformations as she grows up. This layout had been waiting for me to make it for almost a year now. I knew I had the photos and I knew I wanted to do something with them, but what??? Until this theme came along and I new I wanted to make it into a layout with fun little squares. I "stole" a few photos from my son's instagram account for this layout. I love that I can peek in on his world. Because he is awesome. That little groundhog promised spring. I am hoping. It's been a long winter. And if it's delayed, there's a new Maisie Dobbs coming to keep me distracted! I've been wanting to make a black & white layout for a little while, and this picture, which I posted on Instagram this fall, seemed like the right one. I added some yellow pops because it felt just a little too stark without it. I used some really old stuff on this layout! My favorite Instagram posts are the ones with a strong image and succinct message, so I kept my journaling short. Helen Oyeyemi has a new short story collection coming out this month, What is Not Yours is Not Yours. I'm excited! This layout was so difficult to photograph, so pardon the bluish light. Every time we go to the Mall of America, I post our trip on Instagram. I did that for my son's birthday this past month. Interesting to note: If you mention the mall in your post, they read them and comment on your photos! I am impatient to garden! This month we are celebrating love. Not just the romantic kind. But all sorts. Love of people, love of things, love of activities. It's all fair game. We hope you enjoy our lovely loving gallery! This layout took an absurdly long time to be completed. I knew what I wanted to say, which products I wanted to use, and yet it took forever. Some days are like that. Even in Australia. In other dog park related news, I’ve been working on finding all the right items for staying warm while standing outside for an hour. My latest acquisition is Smartwool socks. I have made a love themed page but without the traditional elements of perhaps a significant other as the main focus. I find heart shapes out in nature all the time and wanted to make a page using some of the most recent ones. And the notion is that if we really want to and look closely, we can see love all around us. My One Little Word last year was Play. I made a page about it for my album; these were leftover photos that I decided to use for the family album. I wanted to celebrate our love of playing together. We love playing collaborative games like Pandemic or Forbidden Island where your goal is not to beat each other but to work together to defeat the game. 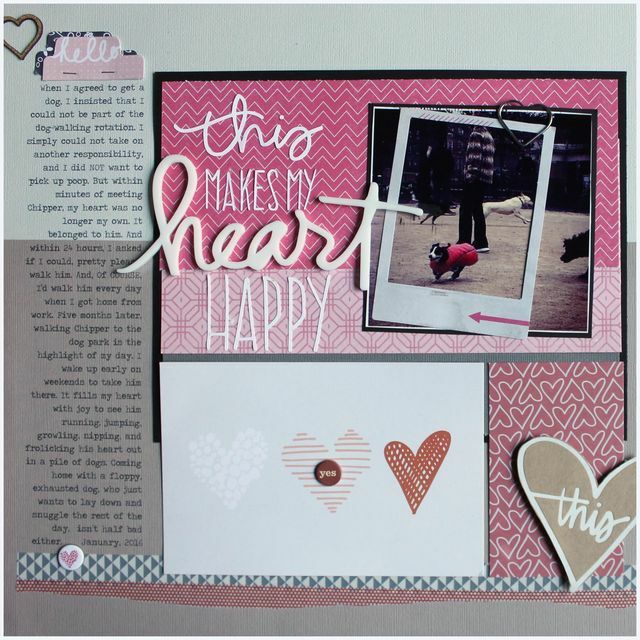 This layout was made from patterned paper scraps and border strips all within the pink color family. Making a monochromatic page consisting of paper strips is one of my favorite ways to use up my scraps. After living in Florida since I was 18, this is the time of year when I get super jealous of anyone who lives where there is snow, so I try to remember that we are lucky to live near the beach. I took this photo with my cell phone this fall...but I didn't want it to feel like an autumn layout. This color scheme felt like a good compromise. This month my husband and I will celebrate our 24th wedding anniversary. I'm not sure how all that time has already passed! 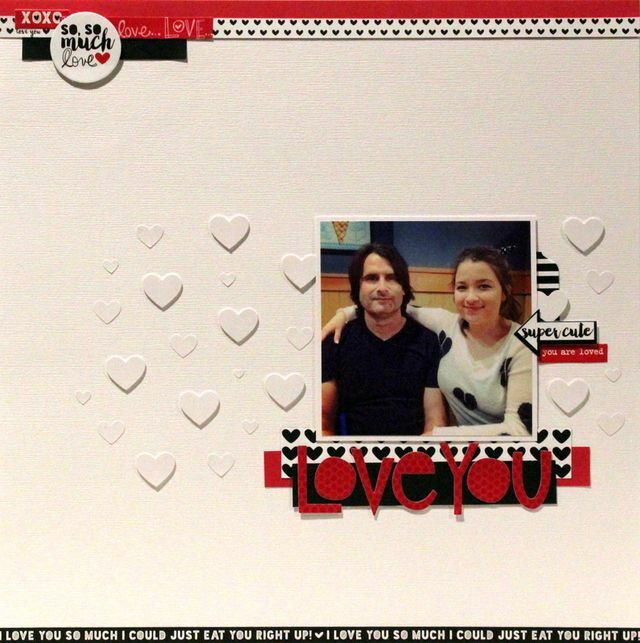 This layout is just a fun page expressing my love for my husband and daughter. I rarely do a layout without a story or any journaling but when I thought about what I would say, it was already said with the words on the stickers! I used a heart punch to add white hearts for a subtle background. To give the larger hearts dimension, I glued them together in stacks of five. All the paper and stickers came from one collection which made this layout super fun and easy to put together! I collect vintage Valentine’s from the 1950’s and I love pink and red so Valentine’s Day is one of my favorite holidays. What’s not to love about a holiday that revolves around chocolate, love and beautiful greeting cards, right? This layout has my heart! It’s been in my mind for months but I never got round to making it. Happy that this theme came along, because I immediately knew It was the perfect match! And it came together so quickly! That’s what I love with having layouts in your mind, they come together so easily because everything is thought out already! I have been shying away from the camera lately, so I went with a picture of my eldest. 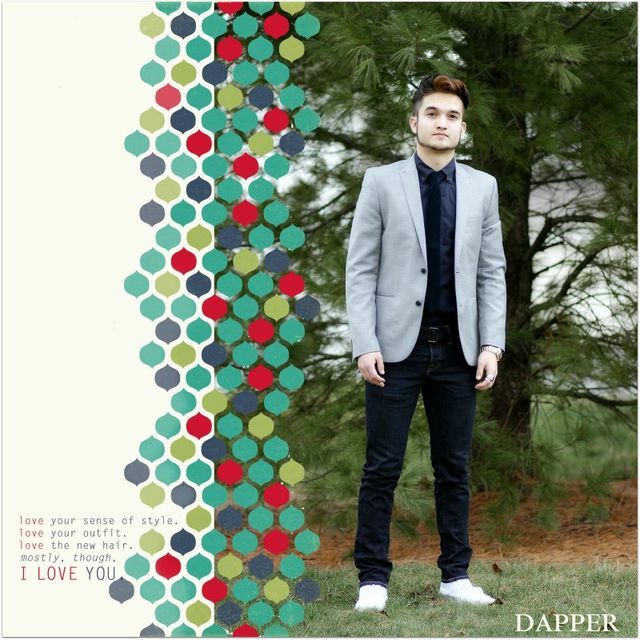 And how much I love him and his sense of style. And I do love it. And him. This year I already know what I am getting my sweet husband for Valentine's day. That's a first! He is terribly difficult to buy for! Hey Scrapbookers! It's Katie Scott. 1. Clear Your Scrapbooking Table: I cleared off my desk completely and put a new paper liner on it. By taking everything off of my desk, I have a fresh slate and I will only put things back on the desk that I know I really want there. Even if my desk doesn't look like this again in 2016, it feels good to have it cleared off right now. 2. Put Your Completed Layouts in Albums: I keep a stack of completed layouts - it was long overdue for me to put them in page protectors and put them into albums. 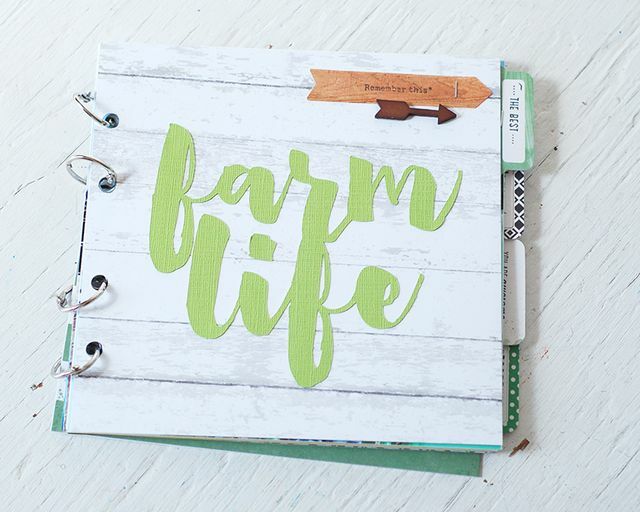 While this process isn't always my favorite part of scrapbooking, it does allow me to take stock of what I have done and seeing all those completed layouts is inspiring. The video link below includes a review of the layouts that I put away in to the albums on my Ikea shelves. 3. Put Away Any Supplies That Are Out: I find it useful to keep some things out that I use over and over for scrapbooking - like paper trimmers, adhesive, scissors, and basic tools. But I seem to accumulate a stack of stuff - like papers, letter stickers and embellishments - that don't seem to get put away; taking time to put these items away helps to completely clear the decks. 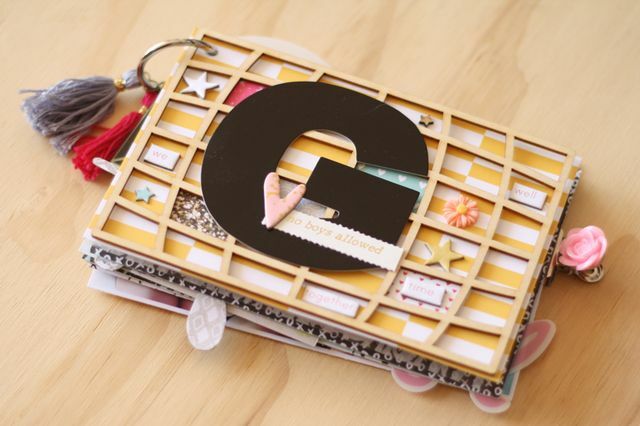 Even if you don't organize all of your supplies - try to pick one category of items, like dimensional embellishments and wood veneers, and get them into order. 4. 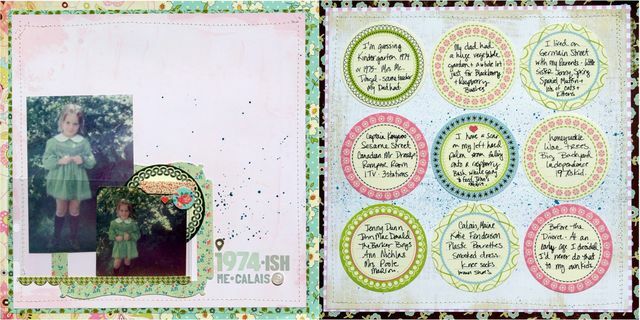 Make a DIY Scrapbook Kit: I like to use an embellishment pack or a piece of patterned paper as my inspiration for creating a scrapbooking kit from my stash. I try to pick supplies that are the newest to me an mix in some older product to help me feel excited and productive. 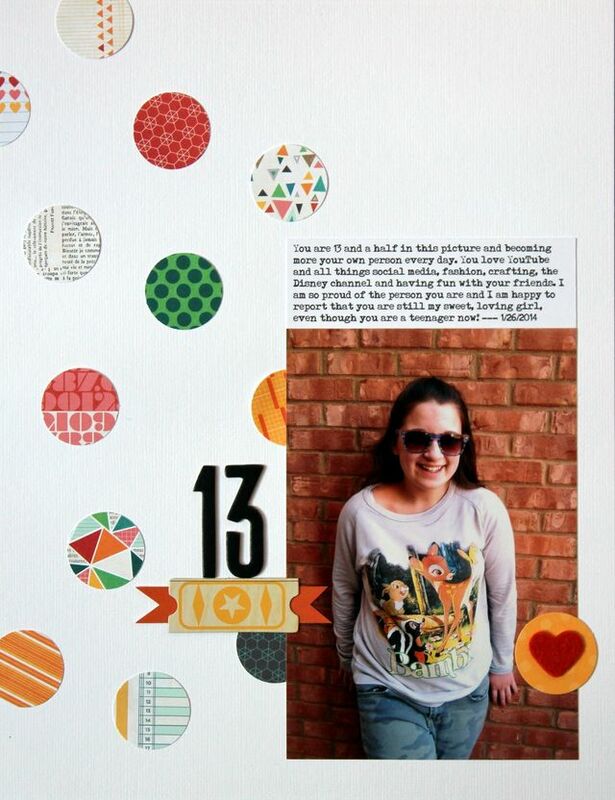 Then I make some scrapbook pages! 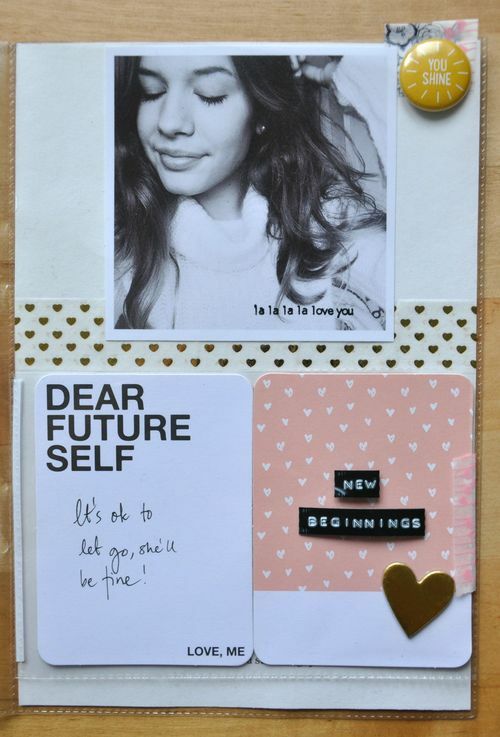 I hope that you will give this clearing the decks and creating a kit process a try - if you do make a kit, please leave us a comment with a link to a photo of you kit - I would love to see it! Hi! It's Katie Scott and I've just returned from a colorful week in Washington DC. I took 1,875 photos on our trip. I don't expect to scrapbook or even print most of the photos. 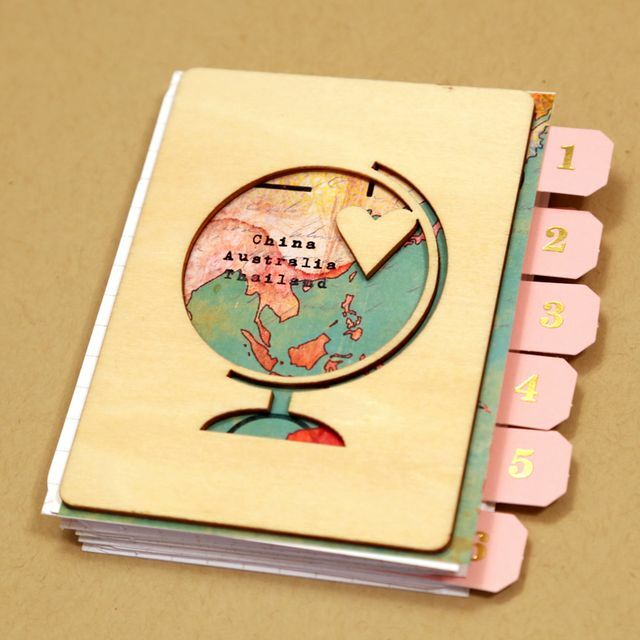 When scrapbooking a trip, I try to think of the story I want to tell first and then select the photos. Here, I am telling the story of our last walk through our neighborhood, Capitol Hill Historic District, which was alive with fall color. 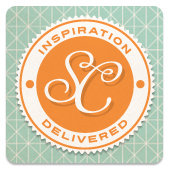 12x12 / Materials: patterned paper (Allison Kreft) + chipboard (Crate Paper) + wood veneers (Crate Paper, Studio Calico) + journaling card (Studio Calico) + paper die cut embellishments (Amy Tangerine, Crate Paper) + stickers (Amy Tangerine) + glitter stickers (KI) + mists (Heidi Swapp, Studio Calico) + letter stickers (Basic Grey). If you'd like to create a layout like this: 1. 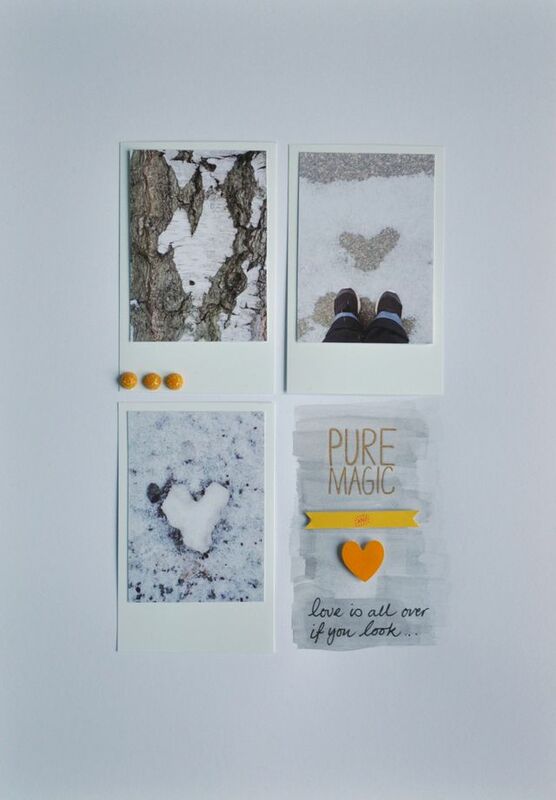 Choose a group of photos and print them out in a collage with a white border. I used Google's Picasa program to make the collage. 2. Pick a neutral background paper. 3. Use whatever is out and on your desk to embellish in a downward diagonal. If you do make a layout inspired by mine, please leave a comment and a link - we'd love to see what you've created! October is here and we are back. Rested and happy. Thank you for your patience as we took a much needed holiday. I’m Dee and I live in Rotterdam, the second largest city of the Netherlands, together with my husband. I have a fulltime job, but when I’m not working I love to papercraft, make and/or eat good food and I have a serious case of wanderlust. I love to explore and find new fun places, things and people that inspire me. I’m obsessed with pictures, although I don’t consider myself a photographer by any means. I would love to be a good one, but I just haven’t invested the time to learn (yet). I may or may not some day.. But until that day the most important thing for me is to document.. So that’s what I’m doing: enjoying life and documenting it, one picture at a time. I would invite you to stop by her blog to see just how talented she is! And now, it is gallery time!! 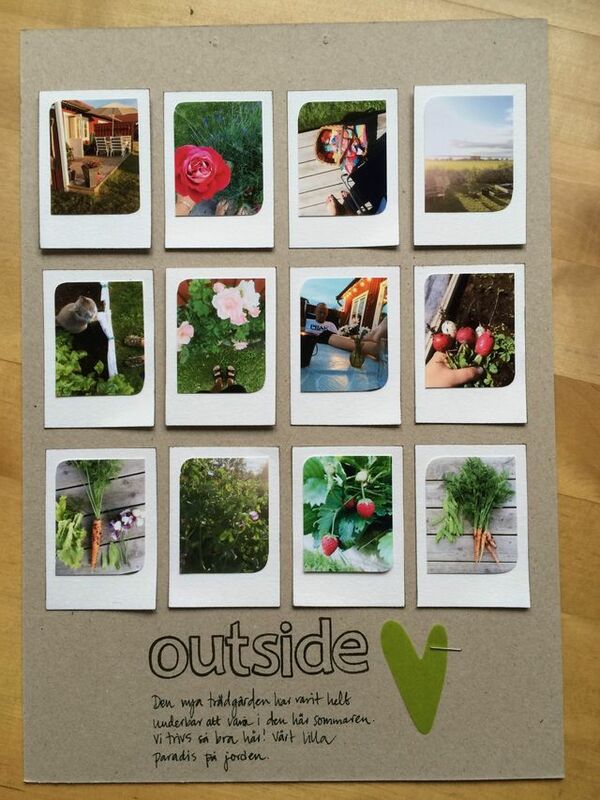 This month we are feeling inspired by the outdoors. Whether it is autumn or spring, there is nothing not to love about this time of year. We hope you feel the same way about the gallery. 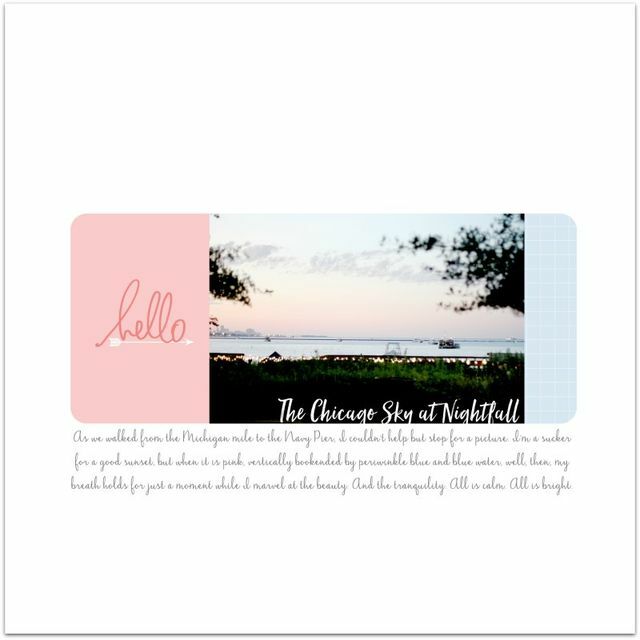 Please remember that all the layouts and journaling can be seen in larger format in the new gallery album. We hope you enjoy! This layout tells a quick story from our summer vacation. I just wanted to record that day, and some little details that capture each family member’s experience. We got a dog a month ago! His name is Chipper, and I cannot believe how much we all love him. When I went to write in the material list I realized I had worked with so little official product! I kind of like it. We have been living here at our new place since May, but we still look out our windows in awe of the gorgeous view. 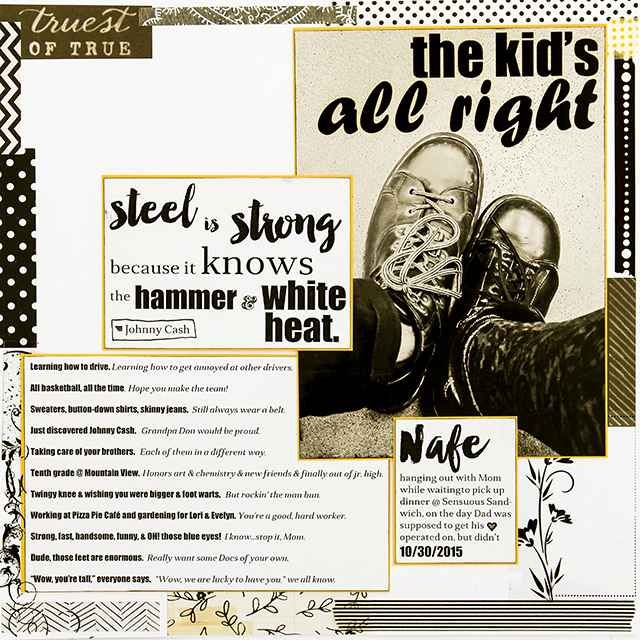 This layout has been on my heart for a while because I really want to capture the authentic story of my life on the pages of my scrapbooks. This is a peek into my daily life and what's important to me. 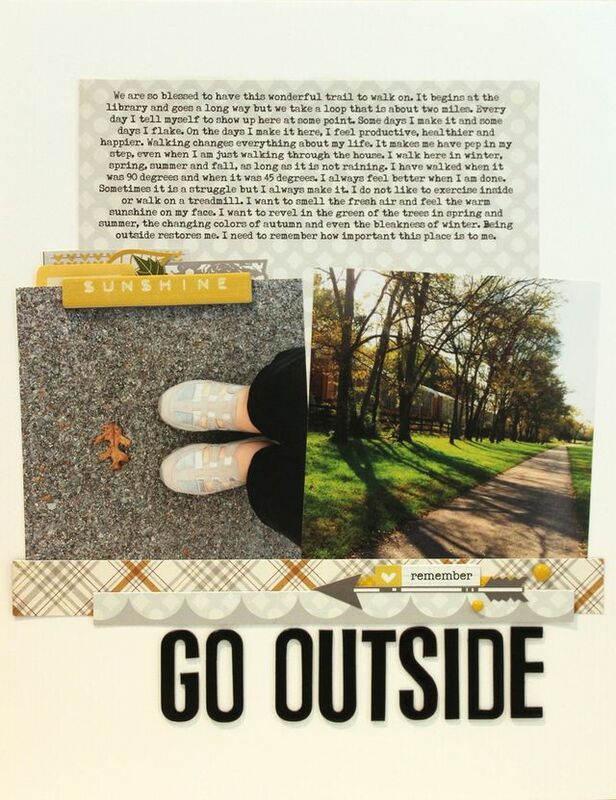 Writing the journaling helped me realize just how important it is that I go outside every day. I'm going to keep this page out for a while to help me remember to make it a priority. In one week, my friend is coming to stay with me for ten days! We are scrappy friends who have only met online. We are going to scrapbook on the road using my new Instax printer and have lots of fun adventures. This is going to be a great October! I hope it is for you too! This photo is a little soft (it was starting to get dark) but I love it so much I don't care! I added the text right onto the photo in Photoshop and then printed it as an 8x12. Such a fast way to make a layout. October is my favorite month! Hopefully I will celebrate it by going on plenty of hikes. Autumn hikes are the best. October is one of my favorites month of the year, is when it really starts to look like spring, sunny days and still not as hot as summer, if it weren't for my allergies Spring would be my favorite season but is most like "it's complicated" relation. I like taking a favorite photo from vacation that has a lot of white space and using it to scrapbook a bigger story. That’s what I did here. 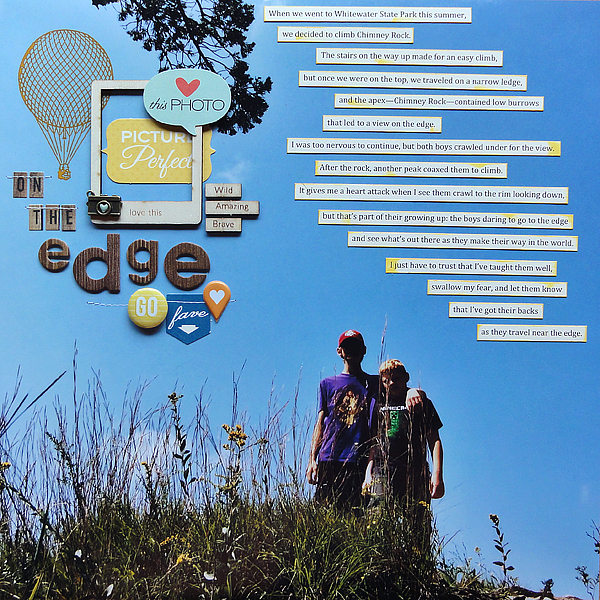 I took the photo of my boys on the peak we had climbed and journaled about their growing up and reaching out. Unlike my boys, I am afraid of heights! 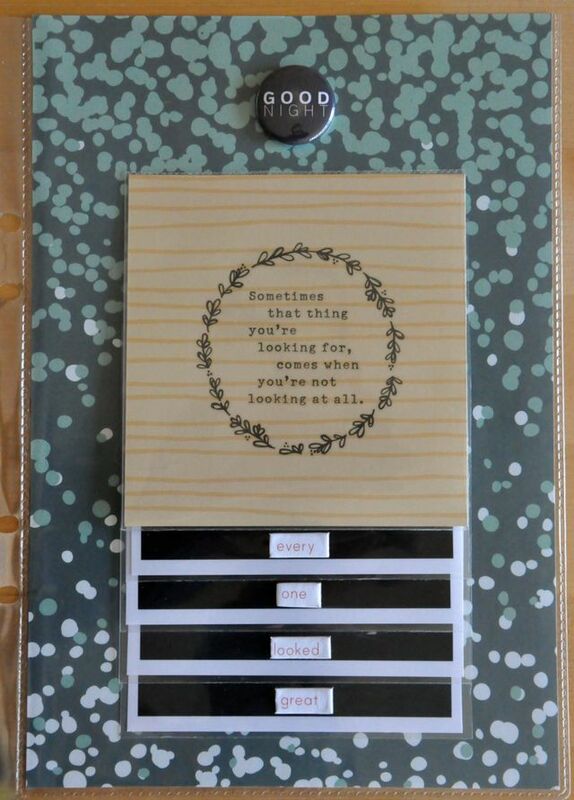 You really can't go wrong with circles on a layout. Add just a couple or a lot—looks good either way. I mixed and matched different patterned papers from a few of My Mind's Eye's 6x6 paper pads for the circles. The fifteen baby chicks we added to our small flock of backyard chickens this past spring have matured and started laying eggs last week! Instead of trying to find the perfect outdoor themed embellishments for this layout, I decided to use what was already out on my desk from the last layout; limiting my supplies helped me to speed up my process and complete this layout in 20 minutes. Several years ago my son and I climbed Precipice Trail to the top of Champlain Mountain in Acadia National Park; when we got to the top we saw the warning that the trail was for experienced hikers only! I love all the pinks and purples from this kit. It's not something that I would typically use for horseback riding at a pumpkin patch but it totally went with my daughter's outfit and it worked! My daughter is such a thrill seeker! I don't think I had ever ridden a horse until high school or college! Last year, the Halloween decorations came out the day before Halloween. It was a rough month and my decorating duties slid down to the bottom of the list. My girls asked if this year, we could do better. And we have. The house is already filled with black cats, owls, and pumpkins. It feels good to be back to normal. This month our gallery theme and our monthly theme are the same! We are trying something new, too! We are so excited to have a themed month and look forward to the continuity of gallery and monthly topics. We thought that with all the preparations for school and all the new things that school's begining brings, that August would be the perfect month to celebrate learning and trying new things. To get started, let's look at our new gallery. This layout is about how my son’s first breakdancing class came to be. It’s kind of a cool story, I think. I finally begin my summer vacation! I have a solid 4 weeks before I have to return to work. I made this layout without hiding the journaling at first. But then since I really did write from my heart, it felt a little strange to have it right there in my album. So I created a flip pocket on top of the page protector to hide the journaling. 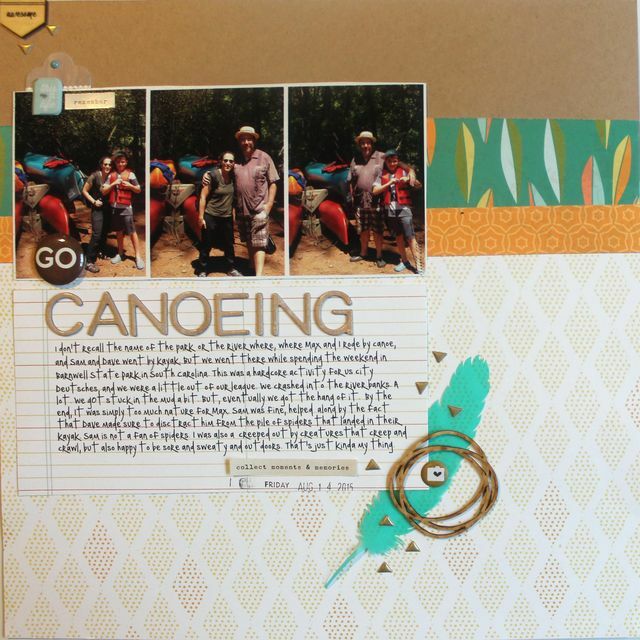 I love to scraplift to work on some of my scrapbooking skills. 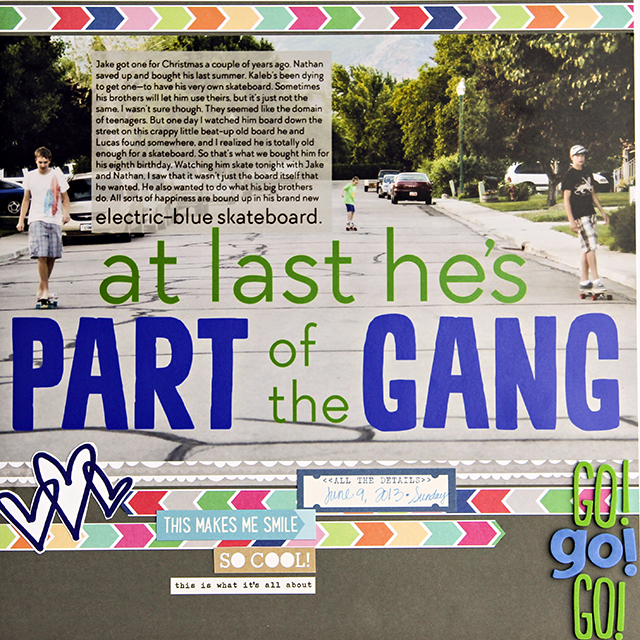 I chose Denise M's "Be Brave and Wild" layout from the scrapbook process video while I made this page and in the video I shared my new way of storing die cut paper embellishments in a watercolor sketch book - I am so excited about this scrapbook storage solution! When I was growing up I was completely obsessed with horses and I spent my summers riding "Bugles the Little Red Pony" at overnight Camp Farley in the Town of Mashpee in Cape Cod, Massachusetts. 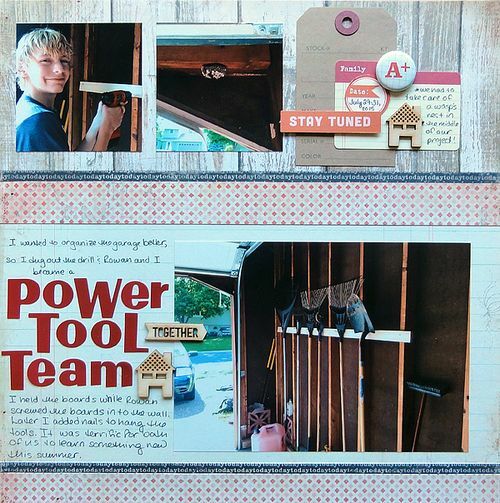 I do the same back to school pages every year—my choice, it makes it easier—so I thought I would celebrate some everyday learning instead, specifically how I’ve started using the internet and my boys to organize the house a bit more. Our first project—organizing the garage—is what I celebrate here. It took me two full days to build the tool holders, purge stuff, and rearrange the garage. 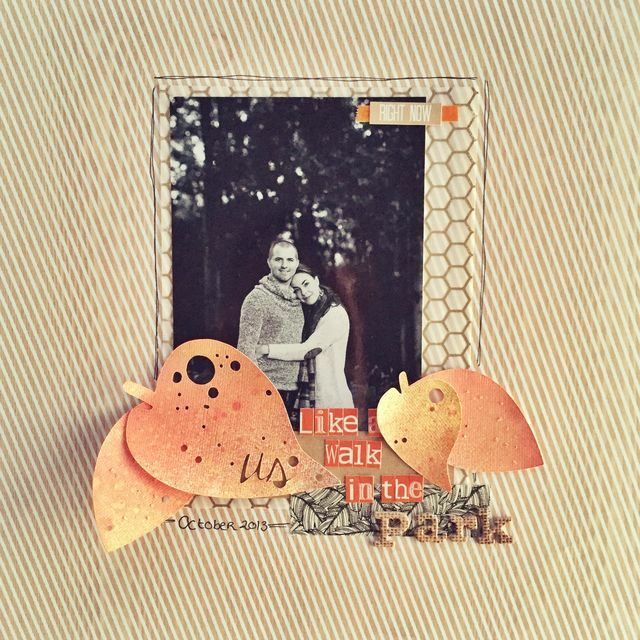 I've been slacking on my scrapbooking lately with a trying life situation thrown my way. I decided to jump back in and do a page for my kids about our new chapter. I began with a template to make the page come together quickly, even though I modified it a bit and added my own touches. I love the huge painted alpha for the title and all the bright and colorful papers/elements for a positive spin on a tough event. My kids and I are currently working through our giant summer bucket list with only 12/36 items left to go! The other day we made giant bubbles in our wading pool and used a hula hoop to put bubbles around each other - it was a blast! Thank you for stopping by! We look forward to an educational and happy month together! and happy birthday to us! We hope that you have enjoyed year six at write. click. 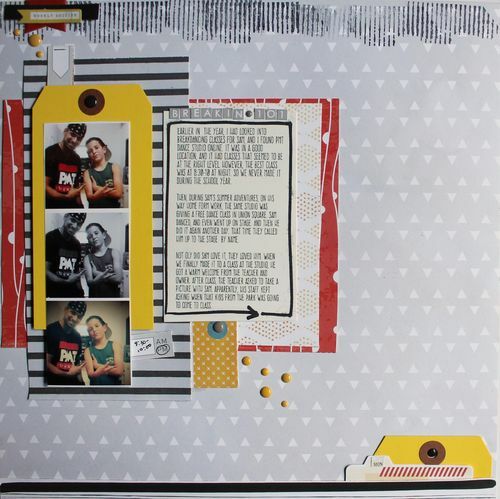 scrapbook! We have had a fabulous year and we are looking forward to another great one. Year Seven begins with a new gallery! One that looks back at our year and how it inspired us. Please enjoy our Inspired by Year 6 gallery. Don't forget that you can see the details and the journaling if you click on over to the photo album. Enjoy! Could there be a road trip to Florida this summer? It’s still up in the air, so I am trying not to get too excited about it. I made this layout inspired by this post by Aliza Deutsch. 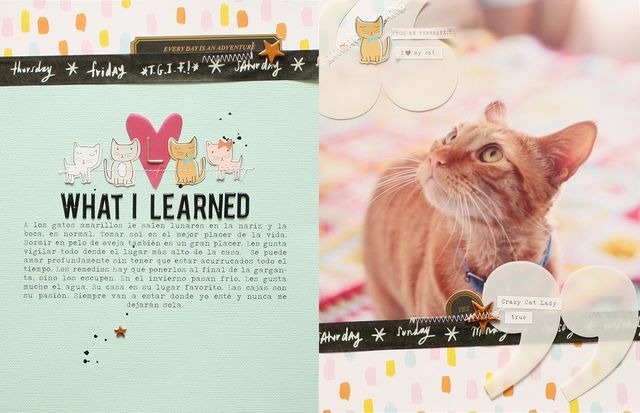 In this post she talks about how to include lessons in our scrapbook. I also scraplifted the double page layout she showed in her post. Of course this is a photo of one my favorites models my cat Lukas and papers from Seven Paper Baxter Cat collection that I was anxiously awaiting. I can't believe is June already! This year has fled! 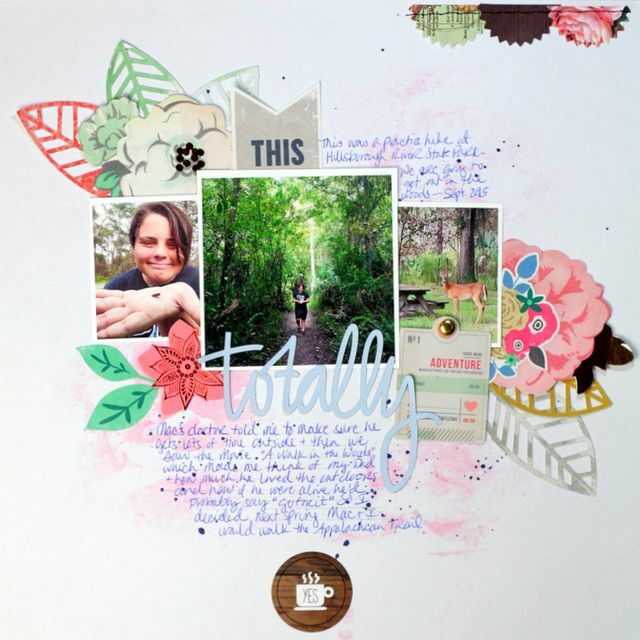 I was so excited to see this month's theme because I love so many layouts on Write.Click.Scrapbook. 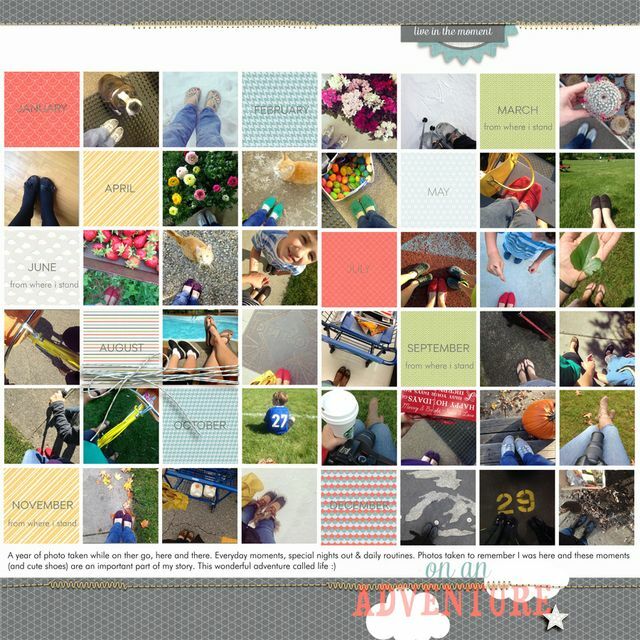 It was fun to read the blog posts from this past year and pick a layout that inspired me but hard to choose just one! 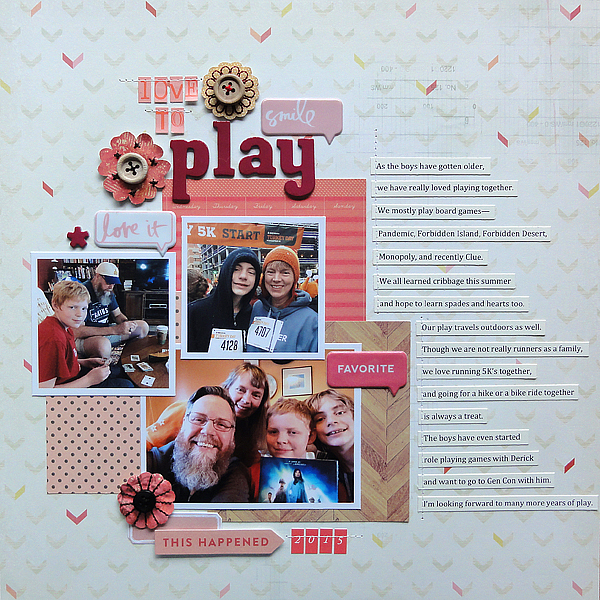 My inspiration came from a layout by Lisa Borbely in the October 2014 Gallery. I used a 6x6 paper pad to punch my designs from and it made putting this layout together easy and fun! I love the freedom of summer. I'm looking forward to nights under the stars listening to music, hot days splashing in the sprinkler, juicy slices of watermelon (my favorite food), ice cream cones, fireworks, sparklers and grilled hot dogs! 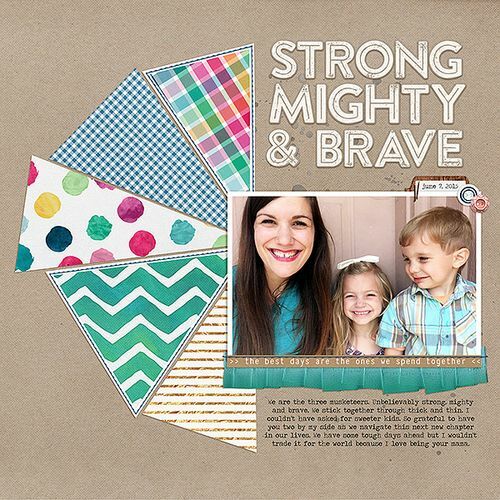 I was inspired by this page from Amy Sorensen last July called Capable of Glistening. 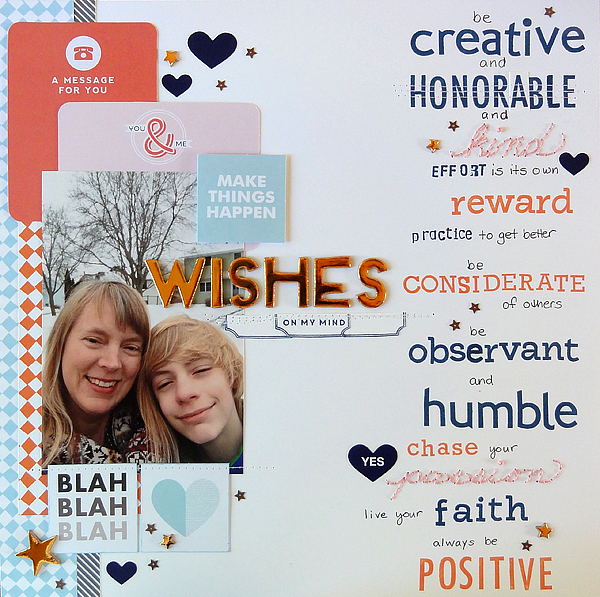 I loved how she missed fonts and enlarged words, so I did something similar with stamps, handwriting, and stitching on this page about what I wish for my son. I can’t stamp straight, and I misspelled a word on this page and covered it up. I’ve learned to embrace the oops! 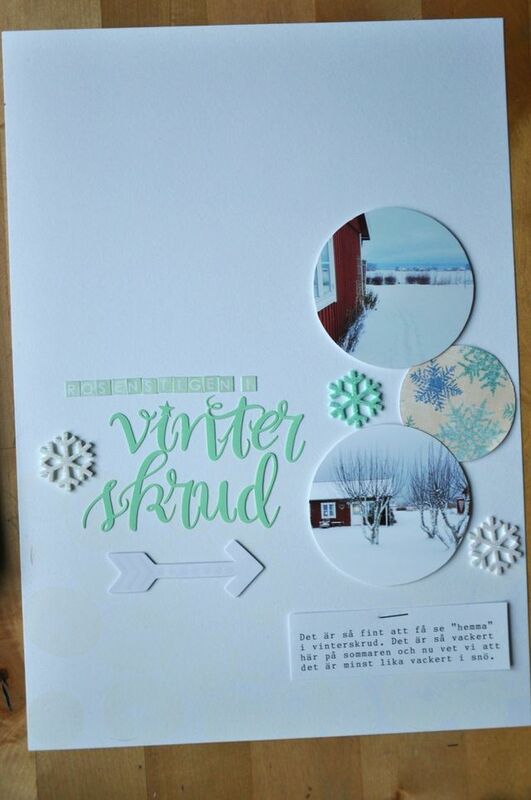 There were so many fun projects for me to choose from for this month´s theme! Here I chose Amy Coose's lovely layout. I love the diagonal design--it's so easy on the eyes isn't it? Minimum journaling on this one. Just a page to keep the memory of my daughter getting in to the high school of her choice. Good job, girl! 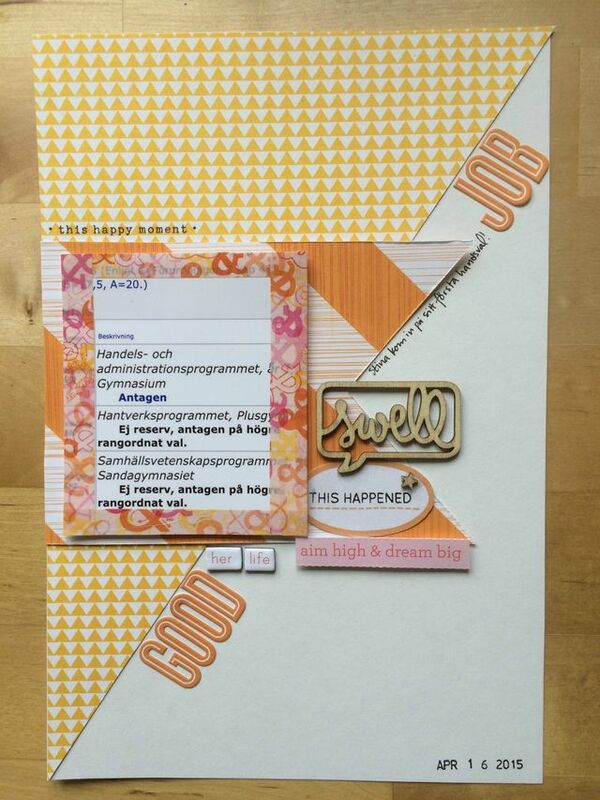 I've been using scraps a lot lately. I dug all of these out of my blue drawer. I was going for a sort of ombre look to go with Jake's Tshirt in the photo, but I also wanted diagonal lines which seem more "zombie" ish than straight ones. I was inspired by one of Marnie's posts from back in March when our theme was favorites. She encouraged us to find a photo from a recent moment that made me smile. It made me think of this picture I had taken with my son Jake. (I totally had to bribe him with cake to take this picture. Luckily we were celebrating my birthday!) 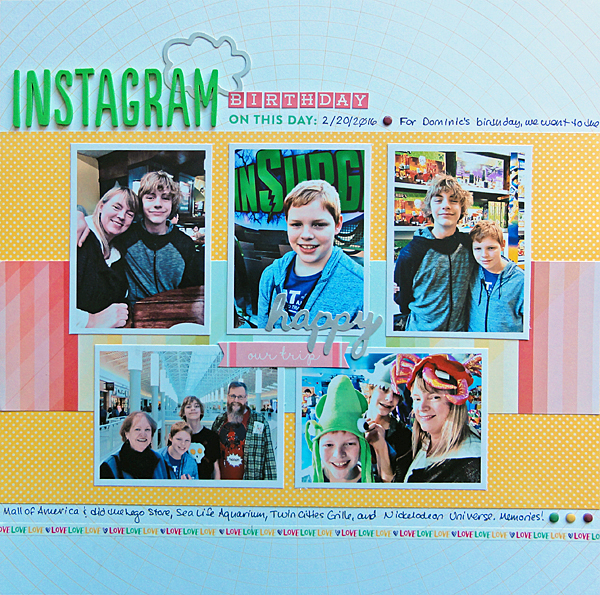 I had already blogged about it, but I decided it need to be scrapbooked too. Sometimes I wait too long and then I forget the original feeling I had about a picture, so I'm glad I took her advice and got this layout finished before I forgot what I wanted to say! This is the first June in five years that I won't be running the Ragnar relay race. (Due to a pesky lingering hamstring issue.) I'm pretty sad to be missing what has become a summer tradition. Hopefully by next June I'll be recovered. 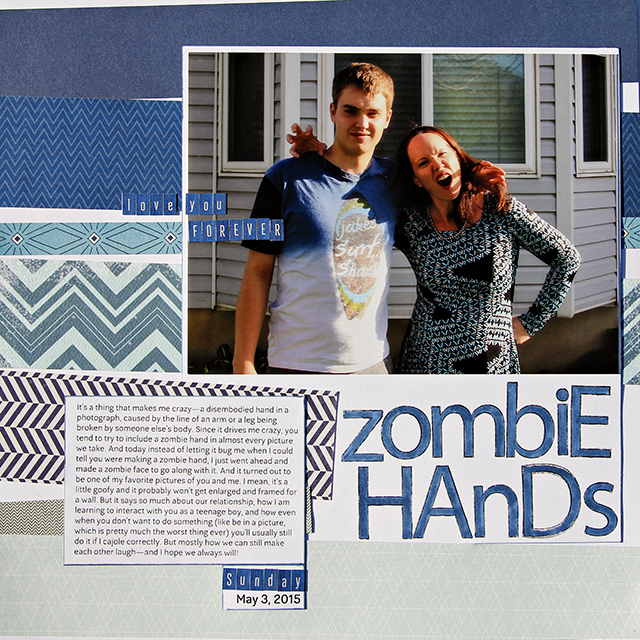 I was inspired by Amy Kingsford's Hello Lovely layout in the June 2014 Gallery. I love using circles on layouts, especially in a grid formation. I never thought I would, but after 27 years of living in Florida, I really miss my home state of Maine - especially in the summer when I long for authentic Maine lobster rolls. My pool body is in hiding but my pool aura is ready ready ready to party!! Thank you for stopping by! Especially on our birthday!!!!!!!!!!!!!!!!! Have a fabulous day! It's not just April fools, it's also the day of our new gallery! This month we are celebrating all things mini. Let's get started with our annual mini album gallery, MiniAlbum Madness V! Here are a preview of all the covers! To see the insides of the albums, be sure to head to the gallery album. 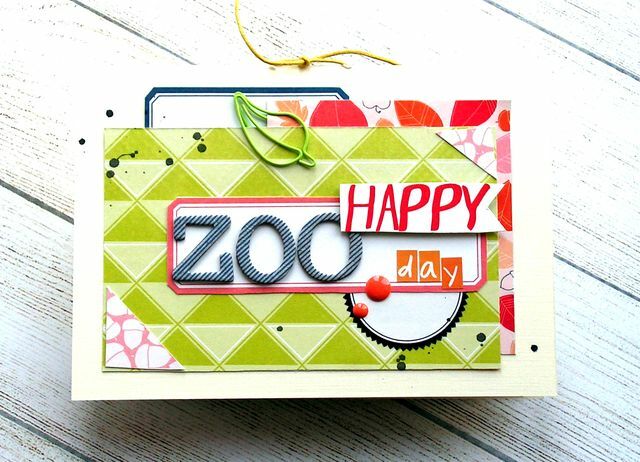 I made this mini to remember very nice and fun day at the Zoo. My son’s birthday fell on Ash Wednesday this year. We weren't able to celebrate that day, so his birthday stretched out a week. 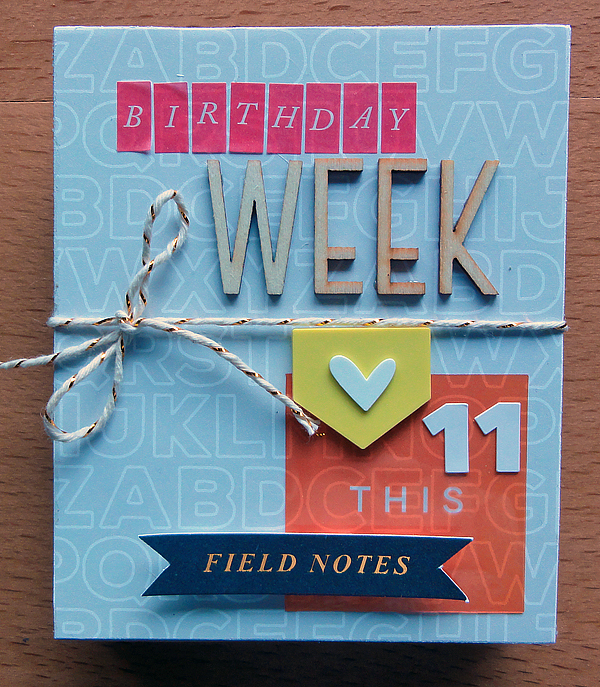 I made this mini album to record the birthday week. For days I had no photos, I used an empty, stamped photo frame. Sadly, I forgot to include the most memorable detail: my son got the stomach flu on his actual birthday, so we had to eat cake the next day. Such a sad dude! I have a mini album—a brag book from Fancy Pants—where I collect recipes from magazines and newspapers. I made this mini for my daughter. 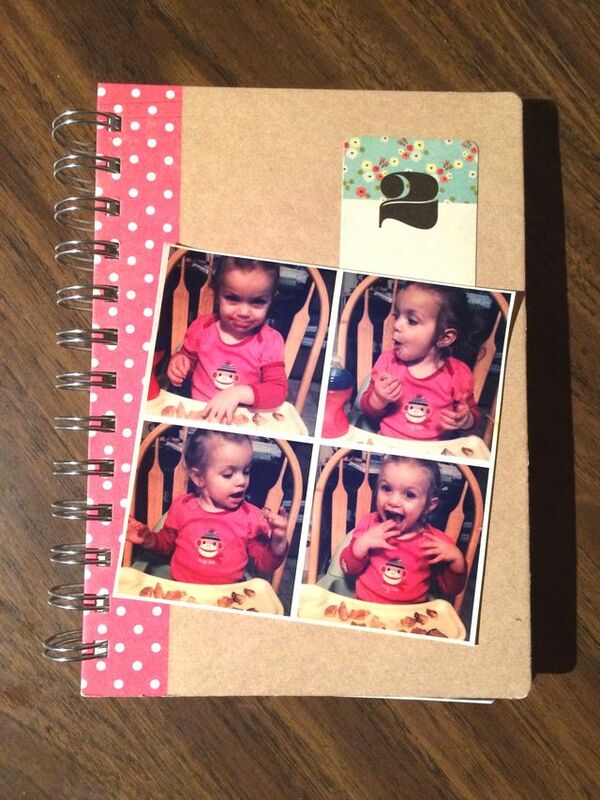 She loves pink polka dots so the cover was perfect! She has a stuffed monkey, Haha, who is her best buddy. I had a stack of photos of the two of them printed for her monkey birthday party she had when she turned two, and decided to put them all into a book. The book had lots of little embellishments and tags printed on the different sized patterned papers inside, so the only elements I added were my photos and a small die cut shape “2” to the front. I collect Pez dispensers, they're so fun and colorful! I have more than 500 of them. I don´t make minibooks anymore, but I really wanted to make something for this gallery! I ended up making flip pockets on a regular page protector and I count that as a mini ☺ I´ll share more in a post soon! I was taking photos of my project and was irritated and confused at how the camera didn't seem to focus properly when I remembered I had taken my glasses off prior to this! This is a travel mini I made to take notes during my trip. I love being able to record things on the go, otherwise a lot of details would be forgotten! I went with a small size that fits nicely in my bag. I am so happy for the warmer weather! We've had a very cold winter and I can’t wait to get the BBQ out! I made this mini to remember the friendship with two of my best friends, one of them is going to live abroad next month and I made this mini to celebrate our friedship as is now. I used mostly Studio Calico February kit Cirque and some embellishments from Pink Paislee Bella Rouge. I love making mini albums, to have a smaller canvas make it easier to fill the pages, and love how they look with all the details and embellishments. I am not really experienced in pocket pages, but I adore this tiny 4x4 album size. It is also a good size for including small, dark, blurry photos taken in your living room, which, by the way, is where we spend a lot of our time. I am already starting to get excited about summer! I can’t wait for warm weather and puttering about my apartment. This mini album showcases some of my favorite images of my son growing up while daddy worked on the family farm. The layout is simple with very few embellishments. 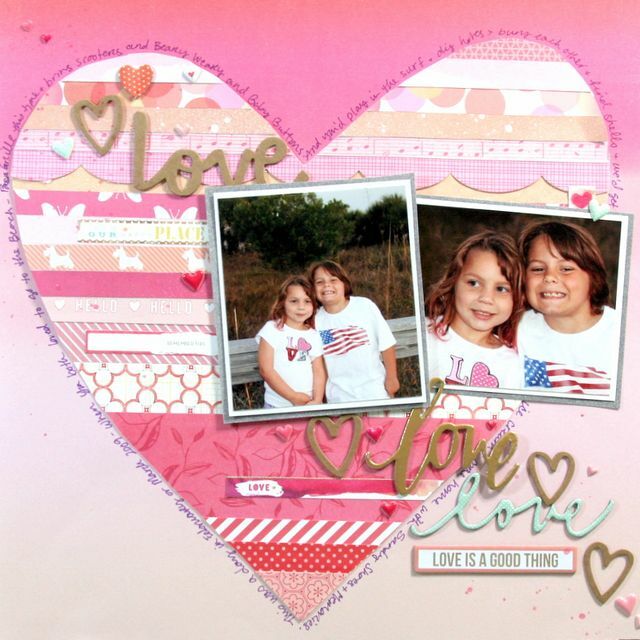 I used the white space on many of the photos for some die-cut word art cut with my Cameo. I never expected crême brulée to become my preferred dessert at restaurants, but when it's on the menu I have to order one! Yum! 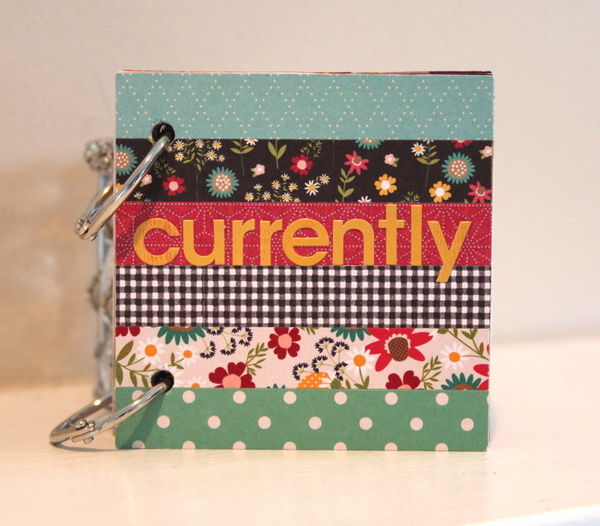 I love to document a snapshot of my current life so I used a "currently" journaling prompt to direct this little album. 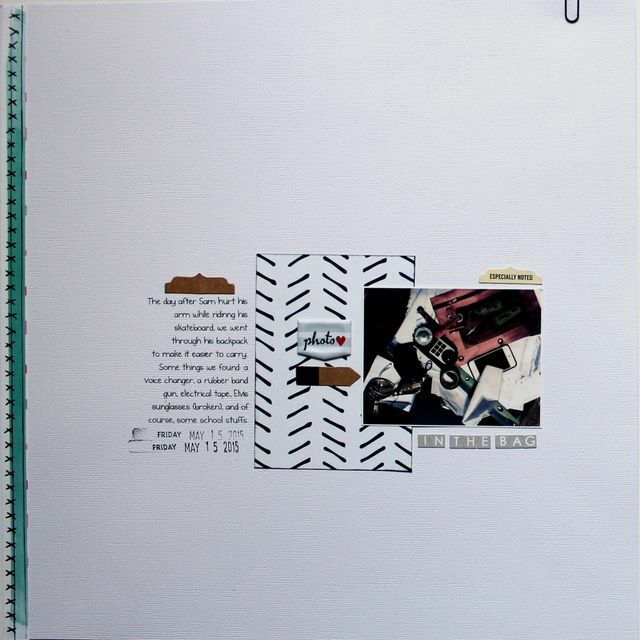 I made this album using chipboard from a cereal box for the cover and a 6x6 paper pad by Pebbles. It makes my life easier when the papers already coordinate, plus, I don't like cutting my 12x12 paper into 3x3 squares! I made the list, grabbed photos from my phone and the interwebs, printed and put it all together. I normally would add enamel dots or some other bulky embellishments but I wanted to keep this very flat so I just used stickers from about six different Simple Stories sticker sheets. Making this little album made me realize how few photos of myself I have so one of my goals for this month is to take a ton of selfies and hand off the camera to my family so they can get me in the picture. I challenge you to do the same! 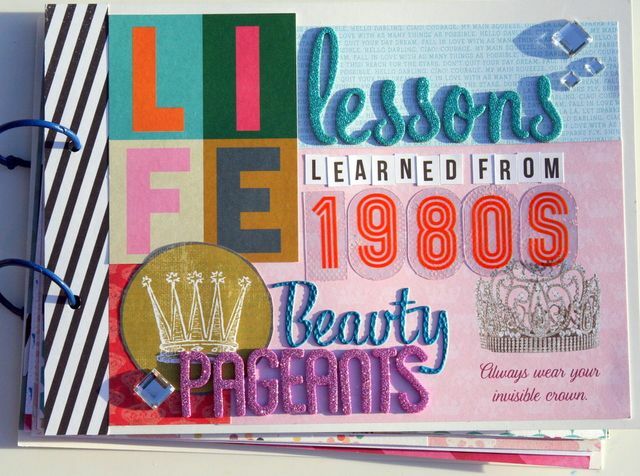 This minibook uses pocket journaling cards that offer advice to summarize the life lessons I learned when I did beauty pageants as a teenager. Since my daughter is a pre-teen, I thought this minibook might be a clever way to offer her some advice in a not so preachy way since the book appears to be giving myself advice. I barely ever wear make up in my everyday life today. I am been slacking on my reading. 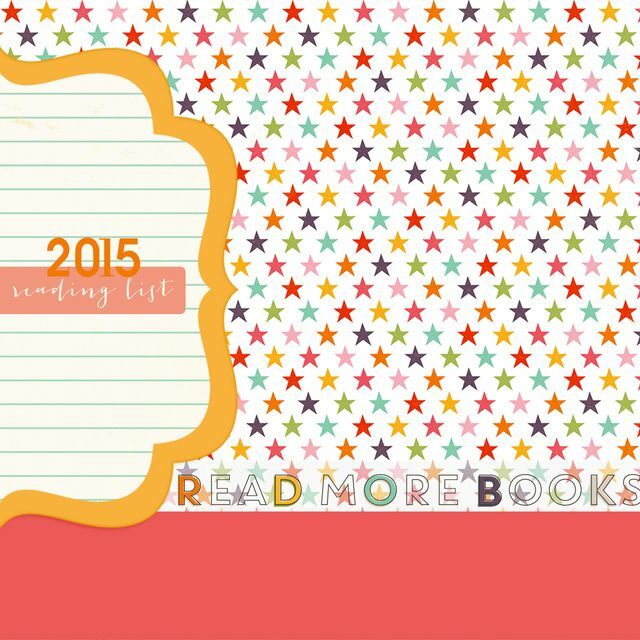 I thought perhaps if I made a list of the books I was reading then I would see that I needed to do a little more! This month I am going to finish a house project that has been pending for months. Hooray! Be sure to head over to the photoalbum to see all the pages. We are excited for a fabulous month!